Brand new. Unmistakable Display of your personal level of fertility every day. 100% Natural - Non-invasive and easy to use. 99% Accurate. Unipath Research - Quality Tested. Clearblue. The only technology based solely on hormone monitoring. The Clearblue Easy Fertility Monitor helps reduce the time it takes to conceive your baby. Trying to get pregnant should be an exciting time for you and your partner. The Clearblue Easy Fertility Monitor provides an advanced monitoring method to maximize your chances of getting pregnant. The Clearblue Easy Fertility Monitor is simple to use, and helps reduce the time it takes to conceive your baby. Detailed view. Test stick monitors hormones in your urine. The screen displays three levels of fertility -- low, high, and peak (shown). Use the "M" button to tell the monitor your monthly cycle has begun. This Clearblue monitor is very simple to use. The unit is equipped with a test stick that is used to monitor hormone levels present in your urine. Briefly, a test is completed by wetting a stick for three seconds, placing it in the test stick slot, and waiting for results. The monitor can be programmed to follow the days of your monthly cycle to help maximize your chances of getting pregnant. In addition, each test displays a fertility status reading on the screen. Based on the results of your test, your chances for conception are displayed on-screen using three bars that correspond to the three different levels of fertility -- low, high, and peak. The monitor also comes equipped with a handy "M Button." When you press the M Button you tell the monitor that your period has started and a new monthly cycle has begun. When you press the button you also establish the six hours each day during which you can do a test. This is called the "testing window." The testing window should be set so that it is convenient for you to test the first urine of the day both on weekdays and the weekend. At the start of each new cycle you can either press your M Button at the same time as you did on your previous cycle, or if you wish, you can change your testing window by setting the M Button at a different time. Remember, your testing window must be convenient for you to test the first urine of each day. This device more accurately identifies a greater number of fertile days than any other method. During the early days of your menstrual cycle, you have a low hormone concentration, i.e. low fertility. It is during these days that your chances of getting pregnant are significantly lower. At 10-12 days into your cycle, you experience a rise in Estrogen (E3G) that signals high fertility. Your chances of conceiving are increased during these days before ovulation because sperm can survive for up to five days. During this stage -- the Follicular Phase -- a follicle containing an egg develops in the ovary. A surge of Luteinizing hormone signals peak fertility, and it is here that your chances of conceiving are at their highest. This peak moment of fertility only last a couple days, but the Clearblue helps you pinpoint this optimal moment for conception. It is at this moment that ovulation occurs, and the follicle containing the egg bursts releasing the ovum. Of course, the egg can be fertilized for up to 24 hours, therefore you have a short duration of time within which you can optimize your chances for conception. The fourteen days after ovulation is called the Luteal Phase. During this time, the remains of the follicle forms the "corpus luteum," and, again, your chances of getting pregnant are significantly lower. All of these phases can be monitor with the help of the Clearblue Easy Fertility Monitor. The Clearblue monitor is easy to use. To perform a test simply switch on the monitor every morning within your testing window and before you go to the bathroom. On the mornings when the monitor requires further information about your hormone levels, a test will be required. Tests must be performed with the first urine of the day. First remove the test stick from its protective foil wrapper and use immediately. Hold the test stick pointing downwards in your urine stream for only three seconds. This is long enough to ensure the sampling end is sufficiently wet. Keep the test stick pointing downwards, take the cap off the handle, and place it over the wet end of the test stick. You will see a red light flashing in the test stick slot. This is the monitor checking to see if the slot is ready to receive the test stick. You should not place the test stick into the slot until the red light has gone out. Holding the test stick by the cap with cut corner pointing downwards, insert it into the slot. Push the test stick down until it lies flat and clicks in place. Once you've correctly inserted the test stick, the display will flash the test stick symbol for about five minutes while the monitor reads and interprets the information in your urine. At the end of five minutes the monitor will ask you to remove the test stick which should be thrown away. Your fertility status will then be displayed. It's that easy. 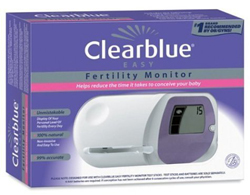 Clearblue Easy Fertility Monitor and instructions. I posted July 21 w/1st ever pos-after 16mos ttc--now I am pregnant again!!! It worked in one month for #4. "The monitor can retain data from your last six cycles to help it learn about your body. This data is constantly overwritten as you continue to use the monitor to ensure that it has the most up to date information available. When you stop using the Clearblue Easy Fertility Monitor, it will retian the last set of information indefinitely. Unipath now offers a Datacard Reading Service. This service provides a printout of your monthly cycle information stored in your monitor. For further information, please call the Helpline." Well, after 5 months with the monitor and 11 months total of TTC, I have decided to contact my OB for more help. I called the CBE helpline today to inquire on how to get the read out from my last 5 months and the customer service rep says that they no longer provide that service. What? I just bought this expensive device because of the way it can track my ovulation and menstral cycles. Now, the last 5 months of data, gone. I have nothing to show to my doctor. I bought this because it took 9 months to get pg the first time, and that ended as an early miscarriage. I couldn't stand the thought of taking that long again! So since I have a longer cycle, I thought I would give this a try. I'm so glad we did! We got pg on the 2nd month of using it!! I was surprised and doubted the reading, because I have a longer (32 day) cycle. It said I o'd on day 14, just like all the 28 day girls out there. I thought, no way, this thing doesn't even work... What do you know! It was right!!! It took a while to get here. They said the address was not good, but it was. It was returned to shipper and I had to buy another one to have it shipped in time. Of course I got credit for the original once it showed up. On Mother's Day 2008, I experienced a miscarriage. It goes without saying how devastated my husband and I were. Our doctor told us to wait at least two cycles before trying again. Naturally I didn't want to wait and I convinced my husband to start ttc after one cycle. Here is where my craziness began. The first month of ttc and not getting pregnant was mostly spent feeling sorry for myself and crying when no one was looking. Yet of course my husband would know that I was crying. On top of that I was in denial that I wasn't pregnant and spent a small fortune on hpts. Also, my cycle would vary by three to four days so I had no idea when I ovulated. I called my doctor to help me figure out when I ovulate and she recommended that I get fertility strips. I read that strips don't won't as well as this monitor for people who a) have irregular periods, b) want to be as certain as possible to know when they ovulate. After a day of reading as many reviews as possible, I went to our local pharmacy and bought the monitor. I also promised myself when reading the reviews that if I got pregnant quickly I would write a review. So here I am after using monitor for two cycles, pregnant! I found out yesterday on my mom's birthday. I am not saying that that monitor is magical, however I gained my sanity back with the monitor because I knew exactly what was going on with my cycle. I was able to relax and enjoy the beauty of ttc. My husband was also able to feel less pressure because I was myself again. I didn't realize at first that you don't set the time window with any clock inside the machine yourself. It does this itself when you set it for the first time. So make sure to set it at the most convenient time as possible for you. If you set it to start on the first day at 9am, you have from 6am to 12pm to test. It asks for your first sample on day 6 so make sure and buy the test sticks too. Its that simple. Anytime before that window or after it, and the machine will not ask for a sample. BUY IT!!! Worth it's weight in gold!!! !